The Mavericks execute and Dirk Nowitzki drills the jumper for your Heads Up Play of the Day! Dallas Mavericks owner Mark Cuban pays tribute to Dirk Nowitzki. Charles Barkley, Scottie Pippen, Larry Bird, Rick Carlisle, Shawn Kemp, and Detlef Schrempf pay tribute to Dirk Nowitzki. The Dallas Mavericks tribute video to Dirk Nowitzki. Here's a look at the memorable night in Dallas as Mavericks legend Dirk Nowitzki is honored in his final home game. Owns career averages of 22.5 points, 8.1 rebounds, 2.6 assists and 35.9 minutes per game…Mavericks’ all-time leader in points (26,786), rebounds (9,594), FGs (9,407), 3FGs (1,471), FTs (6,501), starts (1,157), games (1,188) and minutes (42,603)…passed Oscar Robertson (26,710) for 10th place on the NBA’s all-time scoring list at UTA (4/8/14)…became the 13th player in NBA history to eclipse the 26,000-point mark vs. HOU (1/29/14)…has scored at least 1,000 points in 14 of the last 15 seasons (1999-2012, 2013-14), finishing with 917 points in 2012-13 after being limited to 53 games following right knee surgery…became the 17th member of the 25,000-point club at NO (4/14/13)…2011 NBA Finals MVP…reached the 20,000-point plateau vs. LAL (1/13/10), becoming the 34th player (first European-born player) in NBA history to achieve the milestone…became the franchise’s leading scorer vs. NJ (3/8/08) when he earned his 16,644th point to pass Rolando Blackman (16,643)…recorded his 1,000th career block vs. BOS (2/20/12), becoming 1 of 3 players in NBA history with 1,000+ 3-pointers and 1,000+ blocks (Clifford Robinson, Rasheed Wallace)…19 career 40-point games…236 career 30-point games…as a starter in the 2010 NBA All-Star Game (Dallas), scored a personal-best 22 points to go with 4 rebounds, 2 assists and 1 steal in 28 minutes…named MVP of the 2006-07 NBA season after being the only player in the league to shoot 50% from the field, 40% from 3-point range and 90% from the foul line…finished third in voting for the 2004-05 and 2005-06 MVP award…second Maverick and first European to start an All-Star Game (2007)…in 2004-05, became the first European player (born and raised) to be named First Team All-NBA…also became the first player who did not attend a U.S. high school or university to achieve the honor…12 straight All-NBA Team selections (2000-12)…First Team All-NBA (2004-05, 2005-06, 2006-07, 2008-09)…Second Team All-NBA (2001-02, 2002-03, 2007-08, 2009-10, 2010-11)…Third Team All-NBA (2000-01, 2003-04, 2011-12)…in 2000-01, became the first Maverick in team history to be named All-NBA (Third Team selection)…has appeared in a team-record 12 All-Star Games (2002-12, 2013-14)…named NBA Western Conference Player of the Week twice in a span of three weeks in 2010-11 (11/22-11/28/10 and 12/6-12/12/10)…17-time NBA Western Conference Player of the Week including a Western Conference-best 4 times in the 2009-10 season (only Mav to be named POW 4 times in a single season)…named NBA Co-Western Conference Player of the Month with Michael Finley and Steve Nash after leading Dallas to a 14-0 start (Nov., 2002)…named Western Conference Player of the Month twice in 2004-05 (Dec., Feb.), in Dec., 2005, in Feb., 2007 and in Apr., 2009…became first Maverick to appear on the cover of Sports Illustrated (5/6/02)…against HOU (12/2/04), scored 53 points in an overtime win, marking career and franchise-highs…scored 51 points, which is the most by a Maverick in a regulation game, vs. GS (3/23/06)…in 2000-01, became the second player in NBA history to have 100+ 3- pointers and blocks in the same season (Robert Horry, 1995-96)…in 2005-06, became the third player in league history to average at least 26.0 points while shooting 90.0% or better from the line joining Rick Barry and Larry Bird…during the 2000 All-Star Weekend, participated in the Schick Rookie Challenge and finished second in the AT&T Shootout…was also in the AT&T Shootout in 2001 and 2007 and won the event in 2006…along with TNT analyst/Rockets legend Kenny Smith and San Antonio Silver Stars guard Becky Hammon, won the 2010 Haier Shooting Stars contest on All-Star Saturday Night (Dallas)…finished as the runner-up in the competition in 2011 (Los Angeles). Averaged team-high 21.7 points, 6.2 rebounds, 2.7 assists and 32.9 minutes in 80 games (80 starts)…shot 49.7% (633-1,273 FGs) from the field, 39.8% (131-329 3FGs) from 3-point range and 89.9% (338-376 FTs) from the line…among NBA leaders, ranked 13th in scoring, 29th in FG%, 23rd in 3FG% and 2nd in FT%...led DAL in scoring 45 times (includes ties)…6 double-doubles (point/rebound)…3 30-point/10-rebound games…1 40-point game…3 games with 35+ points…10 games with 30+ points (7-3 record)…23 games with 25+ points (14-9 record)…48 games with 20+ points (30- 18 record)…9 games with 10+ points in the 4th quarter (7-2 record)…6 games with 10+ rebounds…11 games with 4+ 3-pointers (9-2 record)…21 games with 3+ 3-pointers (15-6 record)…35 games with 2+ 3-pointers (26-9 record)…dished out a season-high 7 assists 4 times…24 points (8-14 FGs, 4-6 3FGs, 4-4 FTs), 4 rebounds and 5 assists in 33 minutes vs. ATL (10/30/13)…surpassed 40,000 career minutes vs. ATL (10/30/13), becoming the 27th player in NBA history to log 40,000+ minutes in the regular season…22 points (6-15 FGs, 10-11 FTs) and 4 rebounds in 30 minutes at HOU (11/1/13)…game-high-tying 24 points (7-16 FGs, 3-4 3FGs, 7-8 FTs) to go with 6 rebounds and 2 steals in 32 minutes vs. MEM (11/2/13)…he went 7-8 from the line vs. MEM (11/2/13) and passed Bob Pettit (6,182) for 14th place on the NBA’s all-time FTM list with his 6th FT (the 1st of 2 attempts) at the 51.7-second mark of the 4th quarter…19 points (8-19 FGs, 2-5 3FGs, 1-2 FTs), 8 rebounds and 2 steals in 32 minutes vs. WAS (11/12/13)…he passed Jerry West (25,192) for 16th place on the NBA’s all-time scoring list vs. WAS (11/12/13) with a 3-pointer from the left wing at the 59.9-second mark of the 3rd quarter (the basket gave him 16 points for the game and 25,194 for his career)…28 points (8-12 FGs, 3-5 3FGs, 9-10 FTs), including 12 in 1st quarter and 10 in 4th, to go with 6 rebounds, 3 assists and 2 steals in 36 minutes at MIA (11/15/13)…1st doubledouble with 20 points (8-15 FGs, 1-5 3FGs, 3-3 FTs), 10 rebounds and 3 assists in 33 minutes vs. PHI (11/18/13)…35 points (13-20 FGs, 2-5 3FGs, 7-7 FTs), including 14 on 6-7 FGs in 4th quarter, to go with 7 rebounds and 4 assists in 34 minutes vs. HOU (11/20/13)…he passed Reggie Miller (25,279) for 15th place on the NBA’s all-time scoring list vs. HOU (11/20/13) with a FT at the 2:11 mark of the 2nd quarter (the FT gave him 17 points for the game and 25,280 for his career)…game-high 27 points (9-22 FGs, 9-9 FTs) to go with 9 rebounds in 34 minutes at DEN (11/23/13)...18 points (7-15 FGs, 4-5 FTs), including 13 in 1st half, to go with 6 rebounds in 31 minutes vs. DEN (11/25/13)…with his 1st FT (6,238th career) at the 9:10 mark of the 2nd quarter vs. DEN (11/25/13), he broke a tie with Reggie Miller 6,237) for 13th place on the NBA’s all-time FTM list...Nowitzki passed BKN’s Kevin Garnett for 14th place on the NBA’s all-time scoring list vs. DEN (11/25/13), but Garnett scored 12 points at TOR (11/26/13) to move temporarily back in front of Nowitzki…22 points (11-19 FGs), 6 rebounds, 3 assists and 2 steals in 33 minutes vs. GS (11/27/13)…his 22-point effort vs. GS (11/27/13) gave him 25,383 career points and he again passed Garnett for 14th place on the NBA’s all-time scoring list…23 points (10-13 FGs, 1-1 3FGs, 2-2 FTs), including 10 in 4th quarter, to go with 5 rebounds and 6 assists in 33 minutes vs. MIN (11/30/13)…game-high 25 points (10- 21 FGs, 2-6 3FGs, 3-3 FTs), including 21 on 9-11 FGs in 2nd half (14 on 6-7 FGs in 4th quarter) in 35 minutes vs. CHA (12/3/13)…21 points (7-17 FGs, 1-3 3FGs, 6-8 FTs), including 11 in 4th quarter, to go with 7 rebounds, 3 assists, 2 steals and season-high 4 blocks in 32 minutes at NO (12/4/13)…he passed Patrick Ewing (40,594) for 25th place on the NBA’s all-time minutes played list at NO (12/4/13)…30 points (13-23 FGs, 3-4 3FGs, 1-1 FTs), including 12 in 4th quarter, to go with 6 rebounds and 7 assists in 36 minutes at POR (12/7/13)…he scored 10+ points in the 4th quarter in 4 consecutive games (vs. MIN 11/30/13-at POR 12/7/13), averaging 11.8 points in the 4th during that stretch…21 points (7-14 FGs, 3-6 3FGs, 4-5 FTs), 7 rebounds and 2 blocks in 35 minutes at GS (12/11/13)…game-high 20 points (9-15 FGs, 2-2 FTs) to go with 6 rebounds, 5 assists and 2 steals in 27 minutes vs. MEM (12/18/13)…he passed Bill Russell (40,726) for 24th place on the NBA’s all-time minutes played list vs. MEM (12/18/13)…22 points (10-22 FGs, 2-6 3FGs), 9 rebounds and 5 assists in 43 minutes vs. TOR (12/20/13)…21 points (7-17 FGs, 1-6 3FGs, 6-6 FTs) and 6 rebounds in 30 minutes at PHO (12/21/13)…game-high 31 points (11-18 FGs, 1-3 3FGs, 8-9 FTs), including 10 in 4th quarter, to go with 6 rebounds, 3 assists and 2 blocks in 35 minutes at HOU (12/23/13)…he passed Alex English (25,613) for 13th place on the NBA’s all-time scoring list at HOU (12/23/13) with a turnaround jumper at the 11:08 mark of the 3rd quarter (the basket gave him 15 points for the game and 25,615 for his career)…game-high 25 points (10-17 FGs, 1-2 3FGs, 4-4 FTs) to go with 5 rebounds and 2 steals in 36 minutes vs. SA (12/26/13)…24 points (10-17 FGs, 4-5 3FGs), 4 rebounds, 4 assists and 2 steals in 33 minutes vs. LAC (1/3/14)…he passed Michael Jordan (41,011) for 23rd place on the NBA’s all-time minutes played list vs. LAC (1/3/14)…game-high 27 points (12-20 FGs, 3-4 FTs) to go with 7 rebounds and 4 assists in 31 minutes vs. LAL (1/7/14)…he passed Scottie Pippen (41,069) for 22nd place on the all-time minutes played list vs. LAL (1/7/14)…recorded his 1,000th career steal at the 7:17 mark of the 3rd quarter at SA (1/8/14)…he became the 2nd player in Mavericks history to record 1,000 steals with the franchise (Derek Harper is Dallas’ all-time leader with 1,551 steals)…he joined Kareem Abdul-Jabbar, Karl Malone, Moses Malone, Hakeem Olajuwon and Kevin Garnett as the only players in NBA history with at least 25,000 points, 9,000 rebounds, 1,000 blocks and 1,000 steals…he also joined Rasheed Wallace and Clifford Robinson as the only players in league history with at least 1,000 3-pointers, 1,000 blocks and 1,000 steals…24 points (10-19 FGs, 4-8 3FGs), 4 rebounds, 5 assists, 3 steals and 2 blocks in 28 minutes at NO (1/10/14)…he recorded a team-high plus-minus rating of +31 at NO (1/10/14)…season-high (game-high) 40 points (10-20 FGs, 5-9 3FGs, 15-16 FTs), including 27 in 2nd half (20 in 3rd quarter), to go with 4 rebounds, 4 assists and 2 steals in 33 minutes vs. NO (1/11/14)…Nowitzki, who turned 35 in June 2013, became the oldest player in NBA history to score 40+ points in a victory in which he played less than 35 minutes (Nowitzki was 70 days older than Clyde Drexler was when “The Glide” scored 43 points in 34 minutes for the Rockets in a win at LAC 11/5/97)…Nowitzki scored 20 points in the 3rd period vs. NO (1/11/14), marking the 4th time in his career that he scored at least 20 points in a quarter (also: 29 in 4th quarter vs. UTA 11/3/09; 22 in 3rd quarter at SAC 4/10/10; 21 in 4th quarter vs. HOU 4/18/12)…recorded his 1,400th 3-pointer at the 40.9-second mark of the 3rd quarter vs. ORL (1/13/14), becoming the 24th player in NBA history with at least 1,400 career 3s…27 points (8-22 FGs, 3-6 3FGs, 8-8 FTs), including 10 in 3rd quarter, to go with 8 rebounds and 3 assists in 33 minutes at LAC (1/15/14)…21 points (9-16 FGs, 2-6 3FGs, 1-2 FTs) and 5 rebounds in 35 minutes at PHO (1/17/14)…2nd double-double with 17 points (8-20 FGs, 1-2 FTs) and 10 rebounds in 35 minutes at CLE (1/20/14)…he became the franchise’s all-time leader in offensive rebounds with an offensive board at the 10:21 mark of the 2nd quarter at CLE (1/20/14)…game-high 28 points (10-16 FGs, 3-5 3FGs, 5-5 FTs) to go with 9 rebounds and 4 assists in 32 minutes vs. DET (1/26/14)…3rd double-double with game-high 38 points (13-21 FGs, 1-3 3FGs, 11-11 FTs) to go with season-high (game-high) 17 rebounds and 3 assists in 35 minutes vs. HOU (1/29/14)...it was his 3rd career game with at least 38 points and 17 rebounds (38 points and 17 rebounds vs. ORL 1/18/01; 38 points and 17 rebounds at IND 2/5/02)…Nowitzki became the 13th player in NBA history to reach the 26,000-point mark vs. HOU (1/29/14) with a putback layup at the 1:06 mark of the 2nd quarter (the basket gave him 17 points for the game and 16,001 for his career)…he was fouled on the play and hit the FT to complete the 3-point play (giving him 18 points for the game and 16,002 for his career)…he became 1 of 6 players in NBA history to score 26,000 points with one franchise, joining Karl Malone (Jazz), Kobe Bryant (Lakers), Michael Jordan (Bulls), Hakeem Olajuwon (Rockets) and John Havlicek (Celtics)…he went a perfect 11-11 from the line vs. HOU (1/29/14)…with his 1st FT of the game (6,350th career) at the 5:07 mark of the 1st quarter vs. HOU (1/29/14), he passed Charles Barkley (6,349) for 12th place on the NBA’s all-time FTM list…team-high 34 points (11-19 FGs, 1-3 3FGs, 11-11 FTs), including 12 in 4th quarter, to go with 5 rebounds and 2 steals in 34 minutes vs. SAC (1/31/14)...he went 11-11 from the line vs. SAC (1/31/14), marking the 35th time in his career he went 11-for-11 or better from the stripe in a game…he scored 30+ points in 2 consecutive games (38 vs. HOU 1/29/14, 34 vs. SAC 1/31/14) for the first time since April 2012 (40 at UTA 4/16/12, 35 vs. HOU 4/18/12)…23 points (9-16 FGs, 3-5 3FGs, 2-2 FTs) and 8 rebounds in 30 minutes vs. CLE (2/3/14)…game-high 26 points (10-14 FGs, 3-4 3FGs, 3-4 FTs) to go with 6 rebounds, 3 assists and 2 steals in 34 minutes at MEM (2/5/14)…20 points (5-9 FGs, 2-3 3FGs, 8-9 FTs) in 26 minutes vs. UTA (2/7/14)…game-high 20 points (7-16 FGs, 2-6 3FGs, 4-4 FTs) to go with 5 rebounds and 4 assists in 32 minutes at BOS (2/9/14)…team-high 22 points (7-14 FGs, 1-5 3FGs, 7-7 FTs), team-high-tying 9 rebounds and team-high 7 assists in 36 minutes vs. MIA (2/18/14)…25 points (9-12 FGs, 5-7 3FGs, 2-2 FTs), including 14 in 1st quarter, to go with 7 rebounds and 4 assists in 27 minutes at PHI (2/21/14)…24 points (9-19 FGs, 2-7 3FGs, 4-4 FTs) and 4 rebounds in 31 minutes at DET (2/22/14)…15 points (6-13 FGs, 3-3 FTs), including game-winning jumper at the buzzer, to go with 3 assists and 2 steals in 32 minutes at NY (2/24/14)…he hit a 19-foot jumper at the buzzer to give DAL a 110-108 win at NY (2/24/14)...it was the first buzzer-beater by a visiting player at Madison Square Garden since 11/22/09 (when Kevin Garnett hit one with BOS)…it was the first time that Nowitzki had hit a game-winning shot at the buzzer since doing it in OT at MIL (11/16/09)…it marked the 13th time in his career that Nowitzki made a game-winning basket in the final 10 seconds of a regular-season contest (and the first since 3/30/13 vs. CHI)…game-high-tying 22 points (9-17 FGs, 4-5 FTs) to go with 7 rebounds in 31 minutes at SA (3/2/14)…game-high 27 points (13-20 FGs, 1-2 3FGs), including 11 in 3rd quarter, to go with 7 rebounds in 34 minutes at DEN (3/5/14)…22 points (8-19 FGs, 6-7 FTs), 5 rebounds, 6 assists and 2 steals in 34 minutes vs. POR (3/7/14)…tied John Havlicek (26,395) for 12th place on the NBA’s all-time scoring list with a turnaround fadeaway jumper at the 8:29 mark of the 4th quarter at GS (3/11/14)…game-high 31 points (12-14 FGs, 4-4 3FGs, 3-3 FTs), including DAL’s first 7 points (10 in 1st quarter), to go with 8 rebounds in 33 minutes at UTA (3/12/14)…he passed Havlicek (26,395) for 12th place on the NBA’s all-time scoring list with his first basket of the game (a one-legged fadeaway jumper) at the 11:46 mark of the 1st quarter at UTA (3/12/14) (the basket gave him 26,397 points)…21 points (9-15 FGs, 1-2 3FGs, 2-3 FTs), 6 rebounds and 2 steals in 29 minutes vs. DEN (3/21/14)…4th double-double with 32 points (11-23 FGs, 2-8 3FGs, 8-8 FTs), including 15 in the 4th quarter and OT, to go with 10 rebounds, 6 assists, 4 steals and 1 block in 39 minutes vs. OKC (3/25/14)…he became only the 3rd player in Mavericks history to record that many rebounds, assists and steals in a game in which he scored 30+ points (Michael Finley, Jason Kidd)…21 points (7-15 FGs, 1-4 3FGs, 6-10 FTs), 9 rebounds and 3 assists in 35 minutes vs. LAC (3/27/14)…team-high 19 points (5-10 FGs, 9-10 FTs) to go with team-high 7 rebounds and team-high-tying 7 assists in 30 minutes vs. SAC (3/29/14)…5th double-double with game-high 33 points (13-21 FGs, 6-8 3FGs, 1-3 FTs), including 22 in 1st half (16 in 2nd quarter), to go with 11 rebounds, 3 assists and 2 steals in 40 minutes vs. GS (4/1/14)…6th double-double with game-high 26 points (10-18 FGs, 4-7 3FGs, 2-2 FTs), including 11 in 2nd quarter and 10 in 4th, to go with 11 rebounds and 2 steals in 35 minutes at LAC (4/3/14)…game-high 27 points (11-14 FGs, 1-2 3FGs, 4-5 FTs) to go with 9 rebounds (3 OR) and 5 assists in 34 minutes at LAL (4/4/14)…he passed Dominique Wilkins (26,668) for 11th place on the NBA’s all-time scoring list with a FT at the 8:47 mark of the 3rd quarter at LAL (4/4/14) (the FT, which was the 1st of 2, gave him 18 points for the game and 26,669 for his career)…named Western Conference Player of the Week for games played from 3/31-4/6/14, after leading DAL to a 3-1 week with wins over LAC, LAL and SAC…he averaged 25.3 points, 8.0 rebounds, 3.0 assists, 1.0 steal and 35.5 minutes per game during that stretch (3/31-4/6/14) while shooting 55.7% (39-70 FGs) from the field and 56.5% (13-23 3FGs) from 3-point range…game-high 21 points (9-11 FGs, 2-3 3FGs, 1-1 FTs), including 11 in 1st quarter, to go with 6 rebounds and 3 assists in 33 minutes at UTA (4/8/14)…he passed Oscar Robertson (26,710) for 10th place on the NBA’s all-time scoring list with a 19-foot jumper at the 11:46 mark of the 4th quarter at UTA (4/8/14) (the basket gave him 18 points for the game and 26,711 for his career)…helped DAL clinch playoff berth with 23 points (8-15 FGs, 3-6 3FGs, 4-4 FTs), including 21 on 7-10 FGs (3-4 3FGs) in 2nd half, to go with 8 rebounds, 3 assists and 2 steals in 39 minutes vs. PHO (4/12/14)…game-high 30 points (12-22 FGs, 3-9 3FGs, 3-3 FTs) to go with 5 rebounds and season-high-tying 4 blocks in season-high 46 minutes at MEM (4/16/14)…he passed Clifford Robinson (42,561) for 18th place on the NBA’s all-time minutes played list at MEM (4/16/14)…NWT (illness) vs. MIL (12/14/13)…DND-Inactive (rest) at TOR (1/22/14). 2012-13: Averaged team-high 17.3 points, 6.8 rebounds, 2.5 assists and 31.3 minutes in 53 games (47 starts) while shooting 47.1% (343-728 FGs) from the field, 41.4% (65-157 3FGs) from 3-point range and 86.0% (166-193 FTs) from the line…among NBA leaders, ranked 22nd in 3FG% and T-11th in FT%...6 double-doubles (all point/rebound)…1 20-20 game (point/rebound)…3 games with 30+ points…6 games with 25+ points…19 games with 20+ points…37 games with 15+ points…6 games with 10+ rebounds…4 games with 3+ steals…4 games with 3+ blocks…made season debut at SA (12/23/12) and had 8 points (3-4 FGs, 1-1 3FGs, 1-2 FTs) and 6 rebounds in 20 minutes off the bench…became the 18th player in NBA history with at least 6,000 made FTs at OKC (12/27/12)...he also became just the 4th 7-footer with 6,000+ FTs (Kareem Abdul-Jabbar, Wilt Chamberlain, David Robinson)…19 points (7-15 FGs, 2-4 3FGs, 3-4 FTs) and 6 rebounds in 29 minutes at MIA (1/2/13)…in 1st start of season, 20 points (7-16 FGs, 2-3 3FGs, 4-6 FTs) and 6 rebounds in 34 minutes vs. NO (1/5/13)…20 points (7-14 FGs, 2-5 3FGs, 4-4 FTs), 5 rebounds and 5 assists in 32 minutes at UTA (1/7/13)…with his 1st 3-pointer at the 9:59 mark of the 1st quarter at UTA (1/7/13), he passed Mookie Blaylock (1,283) for 30th place on the NBA’s all-time 3-point field goals made list…17 points (5-8 FGs, 3-3 3FGs, 4-7 FTs), 6 rebounds and 3 assists in 28 minutes vs. MEM (1/12/13)…19 points (7-14 FGs, 1-4 3FGs, 4-4 FTs), including 15 in 2nd half and 10 in 4th quarter, to go with 8 rebounds in 33 minutes vs. HOU (1/16/13)…game-high-tying 18 points (7-14 FGs, 1-3 3FGs, 3-4 FTs) and 7 rebounds in 30 minutes vs. PHO (1/27/13)…with a jumper at the 5:38 mark of the 3rd quarter vs. PHO (1/27/13), he passed Allen Iverson (24,368) for 18th place on the NBA’s all-time scoring list (the basket gave him 13 points for the game and 24,370 for his career)…team-high 26 points (11-21 FGs, 2-6 3FGs, 2-2 FTs), including 12 in 4th quarter, to go with 4 rebounds and 4 assists in 34 minutes at POR (1/29/13)…24 points (8-14 FGs, 3-4 3FGs, 5-6 FTs), 7 rebounds and 2 steals in 36 minutes vs. ATL (2/11/13)…17 points (6-9 FGs, 1-1 3FGs, 4-4 FTs), 8 rebounds, 6 assists and 3 steals in 30 minutes vs. SAC (2/13/13)…game-high 25 points (10-17 FGs, 2-3 3FGs, 3-3 FTs) to go with 7 rebounds and 4 assists in 33 minutes at NO (2/22/13)…1st double-double with team-high 30 points (11-19 FGs, 4-4 3FGs, 4-5 FTs) to go with 13 rebounds and 3 steals in 39 minutes vs. LAL (2/24/13)…6th career 20-20 game with 21 points (8-16 FGs, 1-3 3FGs, 4-4 FTs), season-high (game-high) 20 rebounds and 2 steals in 35 minutes vs. MIL (2/26/13)…it was his first 20-20 game since 4/3/03 vs. LAL (25 points and 22 rebounds), an NBA-record span of 9 years and 329 days between 20-20 efforts (points with rebounds or assists)…it was also his 7th career game with 20+ rebounds, and his first since 12/27/07 (20 rebounds)…20 points (8-14 FGs, 1-3 3FGs, 3-3 FTs) and 8 rebounds in 34 minutes at BKN (3/1/13)…22 points (9-16 FGs, 1-2 3FGs, 3-3 FTs), 5 rebounds and 3 assists in 33 minutes vs. HOU (3/6/13)…3rd double-double with 19 points (7-13 FGs, 1-5 3FGs, 4-5 FTs), including 17 in 1st half, to go with 11 rebounds and 3 assists in 31 minutes at MIL (3/12/13)…4th double-double with 21 points (6-16 FGs, 3-5 3FGs, 6-6 FTs), 11 rebounds, 3 assists and 3 steals in 35 minutes at SA (3/14/13)…3rd straight double-double (5th of the season) with 13 points (6-17 FGs, 1-3 3FGs), 11 rebounds, 4 assists and 2 steals in 33 minutes vs. CLE (3/15/13)…23 points (8-10 FGs, 3-4 3FGs, 4-4 FTs) and 7 rebounds in 34 minutes vs. OKC (3/17/13)…22 points (7-11 FGs, 2-2 3FGs, 6-6 FTs), 6 rebounds and 5 assists in 30 minutes at ATL (3/18/13)…pulled down his 9,000th career rebound at the 11:26 mark of the 4th quarter vs. BKN (3/20/13), becoming the 46th player in NBA history with 9,000+ boards…he also became 1 of 10 players in NBA history with at least 24,000 points and 9,000 rebounds (joining Kareem Abdul-Jabbar, Karl Malone, Wilt Chamberlain, Shaquille O’Neal, Moses Malone, Elvin Hayes, Hakeem Olajuwon, Kevin Garnett and Patrick Ewing)…22 points (8-15 FGs, 1-2 3FGs, 5-5 FTs) and 7 rebounds in 32 minutes vs. BOS (3/22/13)…game-high-tying 33 points (12-21 FGs, 9-10 FTs) and 9 rebounds in 39 minutes vs. LAC (3/26/13)…he moved past Patrick Ewing (24,815) and into 17th place on the NBA’s all-time scoring list vs. LAC (3/26/13) with a jumper at the 8:51 mark of the 1st quarter (the basket gave him 24,816 career points)…he also passed Elgin Baylor (8,693) for 20th place on the NBA’s all-time FGM list with a driving hook shot (his 8,694th career FG) at the 4-minute mark of OT vs. LAC (3/26/13)…21 points (10-20 FGs, 1-2 FTs) and 7 rebounds in 33 minutes vs. IND (3/28/13)…season-high (game-high) 35 points (14-17 FGs, 5-6 3FGs, 2-2 FTs), including 20 in 1st half and 15 in 4th quarter, to go with 7 rebounds in 34 minutes vs. CHI (3/30/13)…he scored DAL’s final 8 points vs. CHI (3/30/13) and hit a game-winning 3-pointer with 2.9 seconds left to lift DAL to a 100-98 win (DAL closed the game on a 15-1 run)…21 points (6-18 FGs, 2-5 3FGs, 7-7 FTs), 8 rebounds (3 OR) and 3 assists in 34 minutes vs. PHO (4/10/13)…6th double-double with game-high-tying 22 points (9-17 FGs, 2-4 3FGs, 2-2 FTs), 10 rebounds and 4 assists in 40 minutes vs. DEN (4/12/13)…19 points (7-14 FGs, 1-2 3FGs, 4-4 FTs), 6 rebounds and 2 blocks in 27 minutes at NO (4/14/13)…he surpassed the 25,000-point plateau at NO (4/14/13) with an 18-foot fadeaway jumper over Robin Lopez at the 6:44 mark of the 2nd quarter (the basket gave him 25,001 career points)…he became the 17th player in NBA history to reach the 25,000-point milestone (and 1 of 9 players in NBA history with at least 25,000 points and 9,000 rebounds)…game-high 26 points (8-18 FGs, 2-4 3FGs, 8-9 FTs) in 35 minutes vs. MEM (4/15/13)…underwent arthroscopic surgery to his right knee (10/19/12)…spent the first 27 games of the season on the inactive list recovering from the surgery (at LAL 10/30/12-at MEM 12/21/12)…also missed 2 games due to a right adductor strain (at GS 1/31/13-at PHO 2/1/13). 2011-12: Averaged 21.6 points, 6.8 rebounds, 2.2 assists and 33.5 minutes in 62 games (62 starts) while shooting 45.7% (473-1,034 FGs) from the field, 36.8% (78-212 3FGs) from 3-point range and 89.6% (318-355 FTs) from the line…among NBA leaders, ranked 8th in scoring, 3rd in FT%, 36th in rebounding and 39th in minutes…led his team in scoring a league-high 45 times...11 double-doubles (all point/rebound)…2 40-point games…8 games with 30+ points…23 games with 25+ points…39 games with 20+ points…11 games with 10+ rebounds… 2 games with 3+ blocks…1st double-double with 29 points (9-17 FGs, 1-4 3FGs, 10-10 FTs), 10 rebounds in 39 minutes at OKC (12/29/11)…became the 31st player in NBA history with 8,000 FGM at the 7:40 mark of the 2nd quarter vs. OKC (1/2/12)…finished with a team-high 26 points (10-16 FGs, 1-5 3FGs, 5-6 FTs), 6 rebounds, 3 assists and 2 steals in 36 minutes vs. OKC (1/2/12)…appeared in his 1,000th career regular-season game vs. PHO (1/4/12) and tallied 20 points (7-17 FGs, 6-7 FTs), 6 rebounds and a season-high 7 assists in 35 minutes…scored his 23,000th career point vs. MIL (1/13/12) with his 1st free throw at the 7:17 mark of the 2nd quarter, becoming the 23rd player in NBA history to achieve the milestone…2nd double-double with 10 points (5-14 FGs) and a game-high 13 rebounds in 38 minutes vs. SA (1/29/12)…game-high-tying 30 points (12-17 FGs, 1-4 3FGs, 5-6 FTs), including 20 in 1st half, to go with 7 rebounds in 33 minutes vs. IND (2/3/12)…24 points (9-15 FGs, 2-2 3FGs, 4-5 FTs), 8 rebounds, 2 blocks in 35 minutes at CLE (2/4/12)…he moved past Elgin Baylor (23,149) and into 22nd place on the NBA’s all-time scoring list on 2/4/12 with a 17-foot fadeaway at the 7:37 mark of the 4th quarter…game-high 25 points (11-20 FGs, 1-6 3FGs, 2-2 FTs), 9 rebounds, 35 minutes at DEN (2/8/12)…he passed Adrian Dantley (23,177) for 21st place on the NBA’s all-time scoring list on 2/8/12 with a jumper at the 1:36 mark of the 4th quarter…game-high 33 points (11-19 FGs, 4-7 3FGs, 7-10 FTs), 3 blocks in 35 minutes at MIN (2/10/12)…3rd double-double with game-high 28 points (10-22 FGs, 2-4 3FGs, 6-6 FTs), including 24 in 2nd half, game-high 12 rebounds in 37 minutes at PHI (2/17/12)… game-high 34 points (11-20 FGs, 4-5 3FGs, 8-9 FTs), 5 rebounds, 2 steals, 38 minutes at NY (2/19/12)…game-high 26 points (10-24 FGs, 1-3 3FGs, 5-5 FTs) and season-high (game-high) 16 rebounds, including 21 points and 10 rebounds in 1st half, in 30 minutes vs. BOS (2/20/12)…recorded his 1,000th career block on 2/20/12 with a rejection on an Avery Bradley shot attempt at the 9:30 mark of the 1st quarter…became 1 of only 3 players in NBA history with at least 1,000 3-pointers and 1,000 blocks, joining Clifford Robinson (1,253 3s and 1,390 blocks) and Rasheed Wallace (1,064 3s and 1,445 blocks)…moved past Robert Parish (23,334) and into 20th place on the NBA’s all-time scoring list on 2/20/12 with a 3-point play at the 5:55 mark of the 1st quarter…he hit a 14-foot jumper and was fouled by Chris Wilcox on the shot…he connected on the FT, giving him his 7th point of the game (23,335th career)…5th double-double with game-high 25 points (9-22 FGs, 1-6 3FGs, 6-8 FTs), including 17 in 2nd half, to go with 12 rebounds in 36 minutes vs. LAL (2/22/12)…6th double-double with 24 points (7-19 FGs, 3-4 3FGs, 7-11 FTs), 10 rebounds, 3 steals, 36 minutes vs. NJ (2/28/12)…recorded his 1,000th career start at MEM (2/29/12) but left the game in the 2nd quarter with lower back tightness and did not return…season-high-tying 40 points (14-21 FGs, 3-8 3FGs, 9-10 FTs), 6 rebounds in 29 minutes vs. UTA (3/3/12)…28 points (8-18 FGs, 12-12 FTs), including 24 points on 7-10 FGs in 2nd half, in 34 minutes vs. NY (3/6/12)…game-high 27 points (10-14 FGs, 2-5 3FGs, 5-6 FTs), including 20 points on 8-9 FGs in 1st half, in 28 minutes vs. WAS (3/13/12)… game-high 27 points (9-21 FGs, 3-7 3FGs, 6-7 FTs), 6 rebounds, game-high 5 assists, 33 minutes vs. CHA (3/15/12)…game-high 27 points (9-19 FGs, 2-3 3FGs, 7-7 FTs), including 19 in 1st half, to go with 6 rebounds and 4 assists in 36 minutes vs. SA (3/17/12)…7th double-double with game-high 33 points (12-19 FGs, 3-4 3FGs, 6-8 FTs), game-high 11 rebounds, 6 assists, 31 minutes at DEN (3/19/12)…8th double-double with 26 points (10-24 FGs, 2-5 3FGs, 4-5 FTs), 10 rebounds, 4 assists, 2 steals, 36 minutes vs. LAL (3/21/12)…game-high 31 points (10-20 FGs, 2-6 3FGs, 9-10 FTs), 7 rebounds, 2 blocks, 39 minutes at HOU (3/24/12)…he passed Charles Barkley (23,757) for 19th place on the NBA’s all-time scoring list on 3/24/12 with his 31st point in OT (FT at the 18.5-second mark of OT)…game-high 25 points (9-19 FGs, 7-7 FTs), including 16 points on 8-10 FGs in 1st half, to go with 6 rebounds in 34 minutes at MIA (3/29/12)…he eclipsed the 1,000-point mark for the 13th consecutive season on 3/29/12…gamehigh 28 points (9-18 FGs, 2-3 3FGs, 8-8 FTs) in 37 minutes at ORL (3/30/12)…he hit the game-winning basket (15-foot fadeaway) on 3/30/12 with 5.9 seconds left to give DAL a 100-98 win...9th double-double with game-high 23 points (10-18 FGs, 3-5 FTs), 10 rebounds, 38 minutes vs. MEM (4/4/12)…10th double-double with 23 points (9-16 FGs, 1-5 3FGs, 4-4 FTs), game-high 14 rebounds, 43 minutes vs. POR (4/6/12)…27 points (10-23 FGs, 1-5 3FGs, 6-7 FTs) in 37 minutes at GS (4/12/12)…11th double-double with gamehigh 24 points (9-28 FGs, 3-8 3FGs, 3-3 FTs) and 14 rebounds in 43 minutes at LAL (4/15/12)…he became the 19th player in NBA history to reach the 24,000-point plateau in OT at LAL (4/15/12)…season-high-tying (gamehigh) 40 points (13-26 FGs, 2-7 3FGs, 12-12 FTs), including 33 points in regulation, to go with 9 rebounds and 6 assists in 53 minutes at UTA (4/16/12)…game-high 35 points (10- 18 FGs, 3-4 3FGs, 12-12), including 31 in 2nd half and 21 in 4th quarter, in 39 minutes vs. HOU (4/18/12)…it marked the 3rd-highest point total in a half in franchise history (Nowitzki, 34, vs. UTA 11/3/09)…missed 4 games due to a sore right knee (at NO 1/21-vs. UTA 1/27/12)…left the game at MEM (2/29/12) with lower back tightness at the 11:09 mark of the 2nd quarter and did not return. 2010-11: Averaged team-high 23.0 points, 7.0 rebounds, 2.6 assists and 34.3 minutes in 73 starts while shooting career-high 51.7% (610-1179 FGs) from the field, 39.3% (66-168 3FGs) from 3-point range and 89.2% (395-443 FTs) from the line… among NBA leaders, ranked 10th in scoring, 18th in FG% and 7th in FT%...led team in points and minutes per game...16 double-doubles…1 40-point game…12 games with 30+ points…31 games with 25+ points…52 games with 20+ points…16 games with 10+ rebounds…4 games with 3+ blocks…1st double-double with game-high 28 points (11-13 FGs, 6-6 FTs), 13 rebounds, 36 minutes vs. CHA (10/27/10)…had his consecutive FTM streak in regular season (3/29-10/29/10) snapped at 82 vs. MEM (10/29/10)… game-high 35 points (15-31 FGs, 5-6 FTs) in 39 minutes at DEN (11/3/10)…game-high 36 points (15-26 FGs, 3-5 3FGs, 3-6 FTs), 8 rebounds, season-high 42 minutes vs. CHI (11/19/10)…5th double-double with season-best 42 points (13-23 FGs, 3-3 3FGs, 13-16 FTs), 12 rebounds (5 OR) in 40 minutes vs. DET (11/23/10)…8th double-double (350th career) with 31 points (10-12 FGs, 3-4 3FGs, 8-11 FTs), season- high 15 rebounds in 39 minutes vs. UTA (12/11/10)… game-high 30 points (12-24 FGs, 3-6 3FGs, 3-3 FTs), 7 rebounds, 39 minutes vs. MIL (12/13/10)…moved past Larry Bird (21,791) and into 25th place on the NBA’s all-time scoring list with a 3-pointer at the 11:18 mark of the 4th quarter at ORL (12/21/10)…game-high 32 points (10-17 FGs, 4-7 3FGs, 8-8 FTs), 5 rebounds, 5 assists, 31 minutes at DET (1/17/11)…scored 22,000th career point on the 2nd of 2 free throws at the 45.8-second mark of the 2nd quarter… game-high 35 points (13-18 FGs, 3-3 3FGs, 6-6 FTs) in 37 minutes at PHO (2/17/11)…with his 18th point at the 7:46 mark of the 3rd quarter vs. UTA (2/23/11), he moved past Clyde Drexler (22,195) and into 23rd place on the NBA’s all-time scoring list…10th double-double with game-high 31 points (11-20 FGs, 2-4 3FGs, 7-10 FTs), 13 rebounds, 34 minutes at TOR (2/27/11)…13th double-double with game-high 34 points (10-22 FGs, 2-3 3FGs, 12-12 FTs), 13 rebounds (6 OR), 35 minutes at GS (3/16/11)…saw his streak of 74 consecutive FTM (3/4-3/27/11; longest in NBA in 2010-11) come to an end at LAC (3/30/11) on his 1st FTA at the 4:09 mark of the 4th quarter...15th double-double with 27 points (10-20 FGs, 1-2 3FGs, 6-6 FTs), 13 rebounds, 34 minutes at LAL (3/31/11)…50th 20-point effort of season with 20 points (10-16 FGs) 8 rebounds, seasonhigh 7 assists, 38 minutes vs. LAC (4/8/11)…suffered a right knee sprain at the 9:10 mark of the 2nd quarter at OKC (12/27/10) and did not return…missed 9 games due to the injury (at TOR 12/28/10-at SA 1/14/11). 2009-10: Averaged team-high 25.0 points, 7.7 rebounds, 2.7 assists, 1.0 blocks and 37.5 minutes in 81 games (80 starts)… shot 48.1% (720-1496 FGs) from the floor, career-high 42.1% (51-121 3FGs) from 3-point range and career-high 91.5% (536-586 FTs) from the line…among NBA leaders, ranked 7th in scoring, 2nd in FT%, 25th in rebounds per game and 15th in minutes per game…3 games with 40 points, 20 games with 30 points, 20 double-doubles, 1 triple-double…game-high 34 points (10-25 FGs, 2-5 3FGs, 12-13 FTs), 9 rebounds, 1 assist, 2 blocks, 39 minutes vs. WAS (10/27/09)…40 points (12-22 FGs, 1-3 3FGs, 15-16 FTs), 11 rebounds (9 DR), 5 assists, 2 steals, 5 blocks, 39 minutes for 1st 40-point game and 2nd double-double of season vs. UTA (11/3/09)…in UTA game, set following franchise marks: points in a quarter (29, 4th), FTM in a quarter (14, 4th), FTA in a quarter (14, 4th), most FTM without a miss in a quarter (14-14, 1.000, 4th)…29 points (9-27 FGs, 1-3 3FGs, 10-10 FTs), 12 rebounds (11 DR) in 41 minutes for 3rd double-double at SA (11/11/09)…4th double-double with 20 points (8-15 FGs, 1-3 3FGs, 3-4 FTs), 11 rebounds (9 DR), 2 assists, 3 blocks in 29 minutes at MIN (11/13/09)…5th double-double with game-high 32 points (12-25 FGs, 1-2 3FGs, 7-8 FTs), including game-winner as time in OT expired, 11 rebounds, 3 assists, 2 steals and 1 block in 43 minutes at MIL (11/16/09)…31 points (10-14 FGs, 11-13 FTs), 4 rebounds, 2 assists, 1 steal, 2 blocks in 30 minutes at IND (11/27/09)…6th 30-point game with 32 points (11-24 FGs, 2-6 3FGs, 8-10 FTs), 9 rebounds, 2 assist, 1 steal, 4 blocks in 44 minutes vs. ATL (12/5/09)…7th 30-point game with game-high 33 (12-20 FGs, 9-9 FTs), 8 rebounds, 3 assists, 1 block in 41 minutes vs. PHO (12/8/09)…8th 30-point game with 36 (14-34 FGs, 8-10 FTs), including game-winner with 1.7 seconds to go in OT), vs. CHA (12/12/09)…9th 30-point game, 9th double-double with 35 points (13-18 FGs, 2-2 3FGs, 7-8 FTs), 11 rebounds, 2 assist, 2 steals, 1 block in 39 minutes at OKC (12/16/09)…11th doubledouble with 22 points (9-20 FGs, 4-4 FTs), 12 rebounds (10 DR), 4 assists, 1 steal and 45 minutes vs. DET (1/5/10)…team-high 26 points (10-28 FGs, 2-3 3FGs, 4-4 FTs), including 16 in 4th quarter, 5 rebounds, 2 assists, 3 blocks at SA (1/8/10)…10th 30-point game of season with 30 points (11-22 FGs, 1-1 3FGs, 7-7 FTs), seasonhigh 16 rebounds, 2 assists, 1 block in 43 minutes vs. LAL (1/13/10)…at 10:57 mark of 4th quarter of LAL game, scored 20,000th and 20,001st points of career on a 14-foot jumper over Lamar Odom to become 34th player in NBA history to score 20,000 points…32 points (9-18 FGs, 14-15 FTs), 5 rebounds, 2 assists, 2 steals, 39 minutes vs. OKC (1/15/2010)…37 points (14-22 FGs, 9-12 FTs), 7 rebounds, 3 assists, 44 minutes at BOS (1/18/10)…came off bench for 1st time since rookie season to score 21 points (6-15 FGs, 9-10 FTs), 8 rebounds, 4 assists, 37 minutes vs. MIN (2/5/10)…13th 30-point outing with game-high 31 (10-19 FGs, 11-11 FTs), 9 rebounds, 1 assist, 1 steal, 42 minutes vs. LAL (2/24/10)…14th 30-point game (2nd consecutive) with 37 points (15-26 FGs, 2-2 3FGs, 5-5 FTs), 9 rebounds, 4 assists, 1 steal, 1 block, 46 minutes at ATL (2/26/10)…15th 30-point game with 36 (14-25 FGs, 8-9 FTs), 8 rebounds, 7 assists, 1 steal, 39 minutes vs. NO (2/28/10)…13th double-double with 27 points (12-23 FGs, 3-3 FTs), 13 rebounds (12 DR), 1 assist, 1 steal, 2 blocks, 42 minutes at CHA (3/1/10)…6th 30-point, 10-rebound game with 31 (12-26 FGs, 7-7 FTs), 12 rebounds, 3 assists and 3 blocks in 42 minutes vs. SAC (3/5/10)…ejected from the game after receiving 2 technical fouls with 9:16 to go in 3rd quarter vs. LAC (3/23/10)…1st triple-double, 17th game with 30 points with 34 points (7-17 FGs, 4-5 3FGs, season-highs 16-17 FTs), 10 rebounds, season-high 10 assists, 1 block, 37 minutes vs. DEN (3/29/10)…19th double-double, 18th 30-point game with game-highs 30 points (10-19 FGs, 10-10 FTs), 13 rebounds in 44 minutes vs. OKC (4/3/10)…40 points (11-24 FGs, 1-2 3FGs, season-highs 17-17 FTs), 10 rebounds, 1 steal and 42 minutes for 20th double-double, 19th 30-point game at POR (4/9/10)… game-high 39 points (12-20 FGs, 2-2 3FGs, 13-13 FTs), including 24 in 2nd half, 7 rebounds, 2 assists and 37 minutes at SAC (4/10/10)…sustained laceration to right elbow during 2nd quarter that required 3 stitches vs. HOU (12/18/09)…missed 1 game due to the injury vs. CLE (12/20/09). 2008-09: Averaged 25.9 points, 8.4 rebounds, 2.4 assists and 37.7 minutes in 81 starts while shooting 47.9% (774-1616 FGs) from the field, 35.9% (61-170 3FGs) from 3-point range and 89.0% (485-545 FTs) from the line…among NBA leaders, ranked 4th in scoring, T-16th in rebounds, 7th in FT% and T-13th in minutes...career-high 4 games with 40 points, 11 35-point outings, 26 30-point nights (career-high-tying, also done in 2005-06), 26 double-doubles… between vs. OKC (2/27/09) and vs. HOU (4/15/09), recorded 25 consecutive 20-point games for the longest such steak (2nd longest of career) in the NBA this season…game-high 36 points (10-22 FGs, 2-4 3FGs, 14-14 FTs), 7 rebounds, 2 blocks, 39 minutes vs. HOU (10/30/08)…30 points (13-24 FGs, 2-2 3FGs, 2-2 FTs), 7 rebounds, 3 assists, 37 minutes at SA (11/4/08)…23 points (8-20 FGs, 2-4 3FGs, 5-6 FTs), 10 rebounds (10 DR), 3 assists, 2 blocks for 1st double-double of season at DEN (11/7/08)…33 points (12-26 FGs, 1-7 3FGs, 8-9 FTs), 7 rebounds, 2 assists, 2 steals, 38 minutes at LAC (11/9)…39 points (13-27 FGs, 1-1 3FGs, 12-12 FTs), 15 rebounds (13 DR), 4 assists, 44 minutes in OT win at NY (11/16/08)…25 points, 10 rebounds for 4th double-double vs. MEM (11/21/08)…5th double-double with 24 points (6-15 FGs, 1-3 3FGs, 11-13 FTs), 12 rebounds, 2 steals, 2 blocks, 39 minutes vs. IND (11/25/08)…29 points (10-27 FGs, 2-6 3FGs, 7-7 FTs), 10 rebounds, 2 assists, 2 steals, 2 blocks, 43 minutes for 7th double-double vs. LAC (12/2/08)…39 points (career-high 17 FGM on 25 FGA, 2-3 3FGs, 3-3 FTs), 9 rebounds, 2 assists, 1 block, 38 minutes vs. PHO (12/4/08)…24 points, 11 rebounds in 35 minutes for 8th double-double vs. ATL (12/6/08)…4th 35-point game with 35 points (16-33 FGs, 3-5 FTs), 10 rebounds (9th double-double) vs. SA (12/9/08)…season-high 46 points (17-30 FGs, 2-4 3FGs, 10-10 FTs) including career-high-tying 17 FGM in 40 minutes vs. OKC (12/13/08)…11th double-double with 27 points (10-22 FGs, 1-4 3FGs, 6-7 FTs), 10 rebounds, 41 minutes vs. DEN (12/15/08)… 27 points, 10 rebounds, 2 blocks for 12th double-double at TOR (12/17/08)…NWT-NBA suspension at LAC (12/28/08) after committing Flagrant-2 foul on UTA’s Matt Harpring (12/26/08)… 13th double-double with 24 points, 13 rebounds, 39 minutes in come-from-behind win vs. MIN (12/30/08)…44 points (15-26 FGs, 2-6 3FGs, 12-12 FTs), 14 rebounds for 14th double-double and 2nd 40-point game in 42 minutes at DEN (1/13/09)…15th double-double with 20 points, 13 rebounds, 2 assists, 1 block, 38 minutes vs. NO (1/14/09)…39 points (16-20 FGs, 7-8 FTs), 8 rebounds, 2 assists, 1 block, 40 minutes vs. UTA (1/17/09)…24 points, including game-winning buzzer beater, with 6 rebounds, 1 steal, 40 minutes at PHI (1/19/09)…16th double-double with 16 points, 11 rebounds (all DR), 3 assists, 38 minutes vs. POR (2/4/09)…44 points (16-34 FGs, 1-2 3FGs, 11-11 FTs), 9 rebounds, 1 assist, 2 steals, season-high 3 blocks, 44 minutes vs. CHI (2/7/09)…scored 14 of team’s 18 OT points in CHI game…34 FGAs marked career high…37 points (13-28 FGs, 2-4 3FGs, 9-12 FTs), 8 rebounds, 1 steal, 39 minutes for 9th 35-point game of season vs. BOS (2/21/09)… 4th 40-point game with 41 points (16-30 FGs, 1-3 3FGs, 8-10 FTs), 9 rebounds, 2 assists, 46 minutes vs. OKC (2/27/09)…18th double-double with 24 points, 10 rebounds, 5 assists, 1 steal, 1 block, 34 minutes for 2nd 20-point, 10-rebound, 5-assist game of season vs. TOR (3/1/09)…19th double-double with 24 points, 12 rebounds, 5 assists, 2 blocks, 42 minutes vs. SA (3/4/09)…19th 30-point game with 34 points (13-24 FGs, 8-8 FTs), 9 rebounds, season-high tying 7 assists, 1 steal, 1 block, 41 minutes vs. WAS (3/7/09)…20th 30-point game and 20th double-double with 34 points, 13 rebounds (seasonhigh 6 OR), 4 assists, 1 steal, 2 blocks, 38 minutes at PHO (3/10/09)…21st double-double with 29 points, 10 rebounds, 1 assist, 2 steals, 2 blocks, 40 minutes at POR (3/11/09)…22nd double-double with 23 points (10-23 FGs, 1-4 3FGs, 2-4 FTs), 12 rebounds, 1 assist, 1 steal, 1 block, 44 minutes at ATL (3/19/09)… 23rd double-double with 26 points, 11 rebounds, 1 assist, 2 steals, 36 minutes vs. DEN (3/27/09)…23 points, 12 rebounds, 1 steal, 32 minutes for 24th double-double at MIN (3/31/09)…25th double-double with 29 points, 14 rebounds (13 DR), 43 minutes at NO (4/12/09)…25th 30-point game with 34 points (8-19 FGs, 2-3 3FGs, 16-17 FTs), 9 rebounds, 3 assists, 1 steal, 1 block, 40 minutes vs. MIN (4/13/09)…26th double-double, 26th 30-point game with 30 points (13-23 FGs, 4-6 FTs), season-high tying 15 rebounds (season-high 15 DR), 2 assists, 2 steals, 41 minutes vs. HOU (4/15/09). 2007-08: In 77 starts, averaged team-high 23.6 points, team-high 8.6 rebounds, career-high 3.5 assists, 0.9 blocks, 36.0 minutes…shot 47.9% (630-1314 FGs) from the field, 35.9% (79-220 3FGs) from 3-point range, 87.9% (478-544 FTs) from the line…among NBA leaders, ranked 7th in scoring and 10th in FT%...20 games of 30+ points, 33 games of 25+ points, 25 double-doubles…team-high 31 points (10-18 FGs, 11-11 FTs), 8 rebounds, 6 assists in 35 minutes vs. WAS (11/26/07)…32 points (10-20 FGs, 2-5 3FGs, 10-10 FTs), 12 rebounds, 5 assists in 38 minutes vs. DEN (12/6/07)…36 points (14-23 FGs, 3-5 3FGs, 5-7 FTs), 7 rebounds, 4 assists, 2 steals in 39 minutes at NY (12/10/07)…31 points (12-24 FGs, 1-4 3FGs, 6-6 FTs), 11 rebounds, 4 assists in 40 minutes vs. ORL (12/17/07)…31 points (10-20 FGs, 2-4 3FGs, 9-10 FTs), 9 rebounds, 2 assists, 2 blocks in 41 minutes vs. PHO (12/19)…30 points (11-17 FGs, 1-3 3FGs, 7-7 FTs), 6 rebounds, 3 assists in 39 minutes vs. LAC (12/21/07)…19 points, 20 rebounds in 40 minutes vs. CLE (12/27/07)…32 points (12-17 FGs, 2-4 3FGs, 6-6 FTs), 11 rebounds, 4 assists, 2 blocks in 34 minutes vs. DEN (1/27/08)…team-highs 31 points (10-21 FGs, 1-3 3FGs, 10-10 FTs), 11 rebounds, 6 assists, 3 blocks in 42 minutes at BOS (1/31/08)…first career triple-double with 29 points (9-17 FGs, 1-1 3FGs, 10-12 FTs), 10 rebounds, career-high 12 assists in 42 minutes vs. MIL (2/6/08)…37 points (13-26 FGs, 2-4 3FGs, 9-10 FTs), 12 rebounds, 2 assists, 2 blocks in 38 minutes vs. POR (2/13/08)…36 points (12-31 FGs, 12-14 FTs), 12 rebounds, 4 assists in 40 minutes at PHO (2/14/08)…29 points (10-19 FGs, 3-3 3FGs, 6-6 FTs), 10 rebounds, 4 assists in 39 minutes vs. CHI (2/25/08)…34 points (15-26 FGs, 2-4 3FGs, 2-2 FTs), 10 rebounds, 3 assists, 3 blocks in 41 minutes vs. SAC (2/29)…30 points (10-26 FGs, 3-7 3FGs, 7-8 FTs), 13 rebounds, 5 assists, 2 steals, 2 blocks in 45 minutes at LAL (3/2/08)…34 points (10-18 FGs, 2-3 3FGs, 12-12 FTs), 9 rebounds, 2 assists while becoming the Mavericks all-time leading scorer (16,644 points) vs. NJ (3/8/08)…35 points (11-23 FGs, 3-6 3FGs, 10-12 FTs), 11 rebounds, 5 blocks in 43 minutes vs. LAL (3/18/08)…22 points (8-20 FGs, 6-6 FTs), 19 rebounds, 2 blocks in 38 minutes vs. BOS (3/20/08)…32 points (11-23 FGs, 1-3 3FGs, 9-10 FTs), 12 rebounds in 38 minutes at PHO (4/6/08)…32 points (12-23 FGs, 4-5 3FGs, 4-5 FTs), including game-winning 3-pointer, in 34 minutes vs. UTA (4/10/08)…32 points (14-25 FGs, 4-9 4FGs, 2-3 FTs) at SEA (4/13/08…NWT-NBA suspension vs. HOU (3/6/08)…missed 4 games (3/25-3/31/08) with left ankle/knee sprain. 2006-07: In 78 games, averaged 24.6 points, 8.9 rebounds and 3.4 assists in 36.0 minutes per game… shot career-highs from the field (50.2%), 3-point range (41.6%) and the free throw line (90.4%)…named MVP of the 2006-07 season and First Team All-NBA…only player in the NBA to shoot 50% from the field, 40% from 3-point range and 90% from the free throw line…scored 10+ points 76 times, 20+ 62 times and 30+ points 19 times…led team in scoring 50 times, in rebounding 41 times, in blocks 21 times and in assists 14 times…41 double-doubles…23 points (8-14 FGs, 7-10 FTs) with 14 rebounds, 8 assists and 2 steals in 41 minutes vs. LAL (12/13/06)…31 points (10-18 FGs, 10-11 FTs) with 15 rebounds (6 offensive) in 34 minutes without a turnover vs. SEA (1/2/07)… scored 10 of 36 points (14-23 FGs, 2-4 3FGs, 6-6 FTs) in the 4th quarter while playing 41 minutes at SA (1/5/07)…season-high 43 points (13-24 FGs, 2-4 3FGs, 15-18 FTs) with 12 rebounds in 44 minutes at IND (1/12/07)…38 points (14-30 FGs, 3-6 3FGs, 7-9 FTs), 11 rebounds, 5 assists, 2 steals, 4 blocks in 46 minutes at TOR (1/14/07)…33 points (12-17 FGs, 9-10 FTs) with 10 rebounds and 8 assists in 39 minutes at ORL (1/23/07)…38 points (14-20 FGs, 2-2 3FGs, 8-9 FTs), 10 rebounds, 6 assists, 3 steals and 4 blocks in 38 minutes without a turnover vs. MEM (2/7/07)…38 points (15-28 FGs, 2-6 3FGs, 6-6 FTs) with 11 rebounds, 8 assists and 2 steals in 43 minutes at MIL (2/13/07)…31 points (10-22 FGs, 1-2 3FGs, 10-10 FTs), 11 rebounds and career-high-tying 8 assists in 34 minutes vs. DEN (2/24/07)…30 points (11-28 FGs, 8-12 FTs), season-high 16 rebounds and 6 assists in a career-high 57 minutes vs. PHO (3/14/07)…missed 1 game due to a sinus infection (12/31/06) and 1 game due to stomach flu (4/3/07). 2005-06: In 81 games, averaged a career-high 26.6 points, 9.0 rebounds, 2.8 assists and 1.02 blocks in 38.1 minutes per game…Posted career highs in field goal percentage (48.0%; 751-1564 FGs), 3-point percentage (40.6%; 110-271 3FGs) and free throw percentage (90.1%; 539-598 FTs)…Ranked seventh in scoring, tied for 15th in rebounding, tied for 38th in field goal percentage, 20th in 3-point percentage, fourth in free throw percentage, 31st in blocks and 25th in minutes per game…Did not score below 14 points the entire season…Scored 20 or more 69 times and 30+ 26 times (Dallas 21-5)…Had 35 double-doules, tied for eighth in the league…Led the team in scoring 58 times and in rebounding 40 games…Scored 16 of his game-high 30 points (10-17 FGs, 8-9 FTs) in the fourth quarter while playing 32 minutes vs. the Hornets (12/3/05)…35 points (14-28 FGs) in 39 minutes at Chicago (12/5/05)…35 points (13-29 FGs, 8-9 FTs) before fouling out in 39 minutes at Memphis (12/9/05)…37 points (14-23 FGs, 8-9 FTs) in 40 minutes at Sacramento (12/22/05)…34 point (9-20 FGs, 15-15 FTs) in with a season-high 7 assists in 40 minutes at Seattle (12/23/05)…Set franchise record for most free throws without a miss in a single game…Career-high 7 blocks in 43 minutes at Denver (1/6/06) …Game-high 35 points (14-21 FGs) in 38 minutes vs. Milwaukee (1/16/06)…scored 19 of his game-high 37 points (14-28 FGs) in the third while playing 41 minutes at New Jersey (3/19/06)…38 points (15-27 FGs) in 44 minutes at Orlando (3/31/06)…51 points (16-24 FGs, 16-17 FTs), 9 rebounds and 5 assists vs. Golden State (3/23/06). 2004-05: In 78 starts, averaged 26.1 points, 3.1 assists and 1.53 blocks while adding 9.7 rebounds and 1.24 steals in 38.7 minutes per game…Shot 45.9% (663-1445 FGs) from the floor, 39.9% (91-228 3FGs) from 3-point range and 86.9% (615-708 FTs) from the line…Missed one game with a sprained ankle on 11/22/04, two games (3/6-3/7/05) with a sore left knee and one game (4/14/05) with a sore left shoulder…Only player to be ranked in the Top 10 in both scoring (fourth) and rebounding (tied for ninth)…One of four players (Kevin Garnett, Shawn Marion and Gerald Wallace) among qualifiers to average at least 1.20 steals and 1.20 blocks…Ranked tied for eighth in the league with 37 double-doubles…Fifth in the NBA in free throw attempts (9.1 per game)…Also ranked 32nd in steals, 21st in blocks, tied for 23rd in 3-point percentage, 12th in free throw percentage and tied for 10th in minutes played…Had 8 combined steals and blocks in the 2005 All-Star Game, the highest total since Michael Jordan in 1988…did not score below double-digits the entire season…Scored 30 points 23 times (Dallas 20-3)…41 points (12-24 FGs, 4-7 3FGs, 13-13 FTs) in 42 minutes at Miami (11/11/04)…32 points (10-27 FGs, 12-13 FTs) and a season-high 18 rebounds in 40 minutes at Memphis (11/27)…Scored a Mavericks franchise-high, American Airlines Center high and career-high 53 points (15-32 FGs, 2-5 3FGs, 21-22 FTs) to go along with 16 rebounds, 3 steals and 4 blocks in 49 minutes vs. Houston (12/2/04)…39 points (14-25 FGs, 4-7 3FGs, 7-9 FTs) in 46 minutes vs. Milwaukee (1/2/05). 2003-04: Averaged team-highs of 21.8 points, 8.7 rebounds, 1.19 steals and 1.35 blocks along with 2.7 assists in 37.9 minutes in 77 games (all starts)…Led the team in scoring 37 times and rebounding 32 times…Scored in double figures in 71 games, 20 or more in 48 games and 30+ 12 times…Had 31 double- doubles…Shot 46.2% (605-1310 FGs) from the floor, 34.1% (99-290 3FGs) from behind-the-arc and 87.7% (371-423 FTs) from the line…Among league leaders, ranked ninth in scoring, 16th in rebounding, 39th in field goal percentage, tied for eighth in free throw percentage, tied for 38th in steals, 26th in blocks and 21st in minutes per game…Game-high 34 points (14-22 FGs, 3-7 3FGs) in 34 minutes vs. Phoenix (4/3/04)… Game-high 35 points (14-23 FGs, 6-6 FTs) and a season-high 18 rebounds in 42 minutes vs. Cleveland (3/30/04)…34 points (12-23 FGs, 10-12 FTs) and 15 rebounds in 45 minutes at L.A. Clippers (3/14/04)…Career-high 9 steals in at Houston (3/7/04)…Career-high tying 5 blocked shots vs. L.A. Clippers (2/24/04)…Game-high 40 points (15-24 FGs, 3-4 3FGs, 7-8 FTs) vs. Detroit (2/7/04)…Career-high 43 points (16-22 FGs, 8-11 3FGs) at Seattle (1/27/04)…Played 7 minutes before spraining his right ankle at Phoenix (11/26/03); missed five games with that injury. 2002-03: Averaged team-highs of 25.1 ppg and 9.9 rpg in 39.0 mpg…Also averaged career-highs of 3.0 assists and 1.35 steals to go along with 1.04 bpg in 80 games…Led the team in scoring 50 times and rebounding 52 times…Scored in double figures in 78 games, 20 or more in 65 games and 30 or more 20 times…Had 41 double-doubles…Shot 46.3% (690-1489) from the field, 37.9% from the 3-point arc (148-390) and a career-high 88.1% from the free throw line (483-548)…His 710 defensive rebounds was a franchise record…Ranked sixth in the NBA in scoring, seventh in rebounding double-doubles and free throw percentage, 22nd in minutes per game, tied for 29th in 3-point percentage, 32nd in steals, tied for 33rd in blocks and 40th in field goal percentage…Played three complete 48-minute games…Led the team in scoring 50 games and scored 20 or more points in 65 games…Scored 30 or more points 21 times…Named Western Conference Player of the Week twice (11/10/02 and 1/5/03)…Fifth career 20-point, 20-board game with 25 points (7-21 FGs, 10-10 FTs) and a season-high 22 rebounds in 47 minutes vs. L.A. Lakers (4/3/03)…Game-high 37 points (15-33 FGs, 2-5 3FGs) with team-high tying 13 rebounds before fouling out in 45 minutes vs. Minnesota (3/10/03)…Had a career-high tying 8 assists vs. Miami (2/15/03)…40 points (12-25 FGs, 14-16 FTs) with game-high 14 rebounds in 47 minutes vs. Milwaukee (12/30/02)…Missed two games in December with a sprained right ankle (suffered on 12/10/02 vs. Clippers) – 12/11/02 at San Antonio and 12/14/02 vs. Memphis. 2001-02: Averaged career and team-highs of 23.4 ppg and 9.9 rpg in 38.0 mpg in 76 games...Ranked eighth in the NBA in points per game (23.4), eighth in rebounds per game (9.9), 19th in free throw percentage (.853), seventh in free throws made (440), 11th in free throws attempted (516), 17th in field goals made (600), 15th in 3-point field goals (139), 16th in 3-point field goals attempted (350) and ninth in double-doubles (38)…Played a career-high four complete games…missed six games to injury all having to do with his left ankle (first time he had ever missed a game due to injuries)...Sat out 11/4/01 game at Memphis due to sprained left ankle…Missed 12/8/01 game vs. Washington due to strained left ankle tendon and four games (4/9-14/02) with a sprained left ankle…Third in the NBA (behind Shaquille O’Neal and Tim Duncan) in 30-point, 10-rebound games with 13…Scored in double figures 71 games…Scored 20 points or more 50 times…Posted 30 or more points 21 times...Led team in scoring 40 times...Led team in rebounding 44 times... Averaged 24.9 ppg (.488 FGs, .416 3FGs) and 10.2 rpg in 53 wins (in which he has played)…Career-high 40 points (12-22 FGs, 6-15 3FGs, 10-13 FTs) and 11 rebounds at Atlanta on 1/15/02…33 points (12-23 FGs, 6-6 FTs) and a career-high 23 rebounds and a career-high tying 8 assists vs. Boston on 2/21/02…In Smmer of 2001 led Germany to a fourth place finish at the European Championships in Turkey…Led the team for the 2002 World Championship in Indianapolis by winning MVP...Averaged 28.7 points, 9.1 rebounds in seven games…Shot .573 from the field, .426 from 3-point range and .714 from the free throw line. 2000-01: Became the first Maverick in team history to be named All-NBA team....Team's leading scorer averaging 21.8 ppg and rebounder with 9.2 rpg in 38.1 mpg....Averaged 1.23 blocks per game....Shot .474 from the field, .838 from the free throw line and .387 from the 3-point arc....One of two Mavericks to play and start all 82 games (Michael Finley was the other)....All offensive totals were career-highs....Made and attempted team-highs from the free throw line (451-538)....Scored in double figures a team-high 80 times....Scored 20 or more points 51 times and 30 points or more 10 times....Grabbed 10 or more rebounds 38 times....In Mavericks wins he averaged 22.8 ppg on .493 shooting compared to just 19.9 ppg (.439 FGs) in the losses....Had his best scoring month of the season in March at 24.7 ppg....Had more double-doubles during season (38) than he had in his first two seasons combined (11)....Tied for eighth in the league in double-doubles....Recorded a career-highs of 38 points (12-26 FGs, 13-16 FTs) and 17 rebounds vs. Orlando (1/18/01)....Became the second player in league history to make over 100 3-pointers (151) and register over 100 blocks (101)....In 1995-96 Robert Horry was the first with Houston with 142 3-pointers and 109 blocks....Career-tying 4 steals in 31 minutes vs. New Jersey (3/13/01)....Had a career-high 5 blocks vs. Houston (3/3/01)....Played a career-high 51 minutes at New York (2/7/01). 1999-2000: Finished second in the league's Most Improved Player voting....Played in all 82 games (only player to do so other than Michael Finley) and averaged 17.5 points, 6.5 rebounds and 2.5 assists per game in 35.8 minutes per game....Among NBA leaders in scoring (34th), rebounding (16th) and 3-point shooting (40th), free throw shooting (28th) and minutes (37th)....Third-leading European scorer in the NBA)....Had nine double-doubles....Led the team in free throw attempts with 348....Shot .830 from the free throw line....116 3-point field goals made was the fourth-highest single season total in Dallas history....Scored in double figures 78 times (in the four games he did not Dallas was 1-3)....Scored a season-high 32 points twice....Had a season-high 4 steals vs. Chicago on 11/27/99....Registered double figures in rebounds nine times and had seven or more rebounds 34 times....Pulled down a career-high 17 boards at Utah on 3/27/00....Set a career-high with 8 assists at Utah on 3/27/00. 1998-99: Averaged 8.2 ppg on .405 shooting with 3.4 rebounds in 20.4 minutes in rookie season....In his final 12 games, he tallied double-figures eight times....During that span the Mavericks posted a 6-6 record....In the 20 games that he logged 20-plus minutes, he had 262 points (13.1 ppg)....Finished second on the team with 27 blocks....Scored a season-high 29 points at Phoenix on 4/16/99. 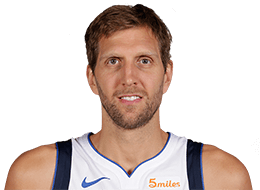 Named Germany's Player of the Year for 1998 by Basket magazine....Led his club team to promotion into the German First Division (Bundesliga)....Prior to reporting to Mavericks training camp was the leading scorer in the league (21.4 ppg) and ranked third in rebounds (8.4)....Played eight games with the German National team in the European Championships 22-and-under tournament....Scored in double figures in seven times, including a 34-point, 15-rebound performance in Germany's final game, a 97-95 overtime win vs. Lithuania on 7/23/98....Germany finished seventh in the tournament with a 5-3 record....Captured global attention at the 1998 Nike Hoop Summit Game in San Antonio over Final Four weekend when his International Juniors team defeated the USA Juniors....Finished the game with a team-high 33 points, hitting 6-of-12 from the floor and collected 14 rebounds with three steals....In two seasons with Würzburg in the second division of Bundesliga, he averaged 23.9 ppg, 8.2 rebounds, and two assists while shooting .572 from the field, .754 from the line, and .370 from beyond the arc....In addition to playing for Würzburg in 1996, he played on the German National Junior team, European Junior Select team, World Junior Select team and the German Under-22 National team....Was also a member of the 1993 German Champion, Bavarian Select team. An ambidextrous shooter…son of Joerg and Helga Nowitzki, who were both elite-level German athletes…Joerg played handball and Helga starred for the women’s national basketball team…his club team, the X-Rays, was named for the discovery of X-rays by German scientist Roentgen in Würzburg in 1895…older sister, Silke, played first league basketball in Würzburg and worked at the NBA in International TV…served a mandatory stint in the German Army (9/1/97-6/30/98)…while playing with Würzburg, coached by Holger Geschwindner, who was a member of West Germany’s 1972 Olympic basketball team…his personal advisor, Geschwindner was a former art student under Shawn Bradley’s grandfather in Germany…has donated to Jonathan’s Place, a home for abused children, for every made 3-pointer throughout the season...founded the Dirk Nowitzki Foundation whose mission is to help provide education, health and well being for children around the world....won the NBA’s Community Assist Award (Feb. 2004 and Dec. 2007)...made an appearance on ABC’s Extreme Makeover: Home Edition (April, 2009)…traveled to South Africa as a part of the NBA’s Basketball Without Borders contingent (Sept., 2009)... serves as a Big Brother for Big Brothers Big Sisters of Dallas... grants wishes each season through the Make-A-Wish Foundation…has made hospital visits to spend time with kids who aren’t able to be at home during the Christmas holidays, purchasing presents for each child he visits and donating to the hospitals…participates in the Mavs Community Ticket Block Program each season, purchasing a block of tickets to each Mavs home game and donating to various community groups…in his spare time he enjoys reading and playing the saxophone and the guitar…www.dirk-now itzki-foundation.org.